As the summer holidays come to an end, everywhere I look there are Back to School banners and promotions to be seen. The talk of admissions, books and uniforms along with woes of teachers mourning the end of the long summer surrounds me. It’s everywhere, except it’s not something I can take part in. Not just yet anyway. Baby Z is yet to join the academic mayhem that will take over all our lives (and end my precious lie-ins too), but as I see the new Frozen themed bags and funky stationary around me, I can’t help but think back to my own school days. Join me on a trip down memory lane to how school used to be like. Covering all the school booksin brightly patterned paper, adding on a label with my name, class and subject at the front of each. It took an entire evening with my dear mother at the start of every academic year to cover all my books, but the mammoth task also built up the excitement of joining school again. Slam Book.I suppose these are now replaced by the Year Books now, but before leaving my school friends in Saudi Arabia, I ensured that all my friends filled the Slam Book. It required one to answer a set of about 50 questions about themselves that I had chosen, along with personal messages and a photograph of themselves. We didn’t quite have Instagram handles to add, but I so wish we did, because I still have my Slam Book, and would have loved to be able to get back in touch with my friends. Rubber Mountains.When the class got utterly boring, we made rubber mountains. This basically entailed of rubbing your eraser, collecting the residue and piling it high into a little mountain on our desks. Class Prefects.Of course, I was the class prefect in my last year at the Indian International School, and I wore my badge with pride. I would delegate tasks and be “in charge” when the teacher was not in the class. I was not a mean one, I promise, because I tended to get along with everyone. Water Cooler Meetings. With the weather very much like Dubai, summers in Saudi meant we could huddle around the Water Cooler outside the classroom, at the end of the corridor, and discuss the latest gossip. Also, I have vague memories of horror stories of a severed hand found on the cooler which spooked us all out from going to the Water Cooler, but now that I think about it, I’m pretty sure it was a hoax….Right? Ice Lollies.If my father was ever late in collecting my sister and I from school, enjoying a cola flavoured ice lolly would be our way to pass the time as we sat under the shade of the huge Banyan tree inside the school gate. I always developed a cough soon after, but those lollies were SO worth it! The Overhead Projector.Before the era of whiteboards, the overhead projector ruled the classroom. If there was ever an opportunity to be in charge of this wondrous technology during class, my hands would shoot right up. MSN. Dialing for the Internet, waiting patiently as it made the “Krrrr Bzzz Krrrr” noises, and eventually logging on to MSN Messenger was an absolute MUST after returning back from school each day. Sitting on the Bench.The hierarchy of students was established by the benches during assembly time. Only Year 10 and Year 11 students were allowed to sit on the benches, and what an epic feeling it was, whilst the rest got cramps by sitting on the floor! Games dictating our future.Whether it was the “Colour Colour, which colour do you choose?”, “Kiss Marry and Snog”, or the “Percentage Game”, all of these were of course believed to be absolute truths of our future at the time we played them. 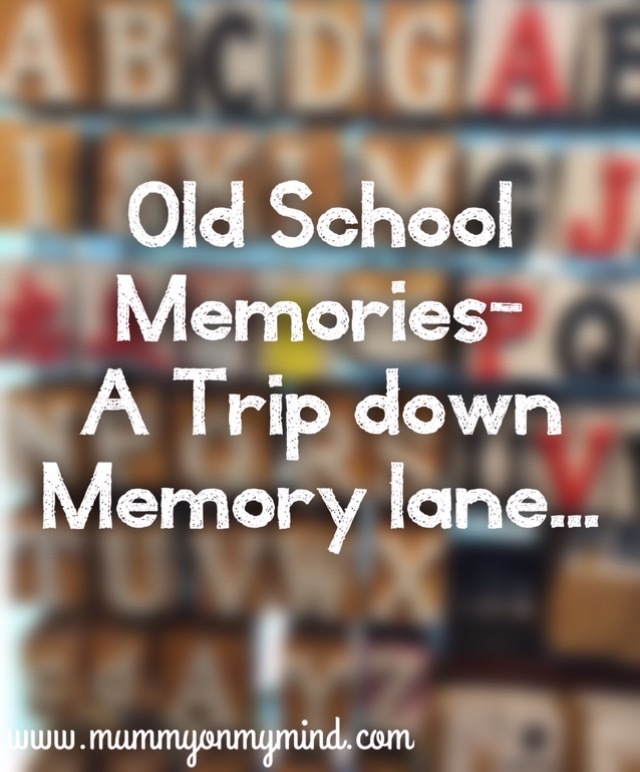 There are so many more old school memories that I am fond of, and a few that I would rather forget! How many of the above do you remember doing too? Are there any memories you would like to share? Feel free to jot them down in the comments section below, so we can all laugh together! Haha thank you! Glad you enjoyed the read!